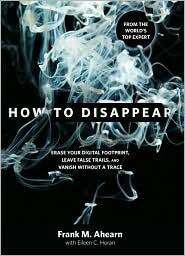 Frank M. Ahearn is a skip tracer and international “privacy consultant.” His latest book, co-authored with partner Eileen C. Horan, is entitled HOW TO DISAPPEAR. Next Thursday evening, October 28th, we’ll hear about famous and infamous cases where he was enlisted to track down elusive people. We’ll also discuss, in this age of digital footprints, the three keys to disappearing, whether simply for privacy or because you need to get lost. Go to the 2010 Chapter Meetings page at the right for more information about scheduling and directions to the Muhlenberg Library. As usual, our meetings are open to the public! This entry was posted on October 24, 2010 by nysinc. It was filed under Events .